Many were confuse thinking that Hagupit is already the local name of the typhoon expected this week, as it turned out, ‘Hagupit’ is its international name. Many are now curious about how the typhoon got a Tagalog word as its international name? Hagupit is only one out of five typhoon names Philippines had chipped in to the list of international names for tropical cyclones used by World Meteorological Organization Typhoon Committee and UN Economic and Social Survey for Asia and the Pacific (ESCAP). Hagupit is a Filipino word literally meant to lash with strong force. Every year, Southeast Asian countries such as Cambodia,Thailand, China, Korea, Hong Kong-China, Japan, Laos, Malaysia, Micronesia, Macau-China,Vietnam, Philippines, together with US make up five lists of tropical cyclone names to be used for a year. Currently, Hagupit is on the third list. The other names contributed by Philippines are Maliksi, Talas, Lupit, and Danas. All the words seemed to be connected with a storm. Hagupit was already used as an international name in 2008 as it passed through the Pacific from September 19 till 23. When it entered the Philippine Area of Responsibility, it was given the local name of Nina on September 23, 2008. Its storm signals was raised to 3 in the northern Luzon. Danas was used in October 6 till 7, 2013 and was named as Ramil when it entered PAR. 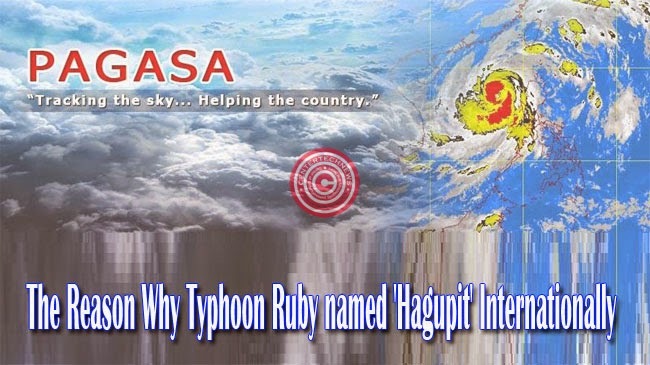 As Hagupit reaches PAR in 2014, it will be given the local name of Ruby and it is expected to cause storm surges with heavy rain and strong winds.